Kingshill Baptist Church is a friendly, growing church in a semi-rural situation. The congregation comes from a variety of backgrounds and traditions, and our desire is to be effective as God's people both in our community and in the wider world. Our Sunday morning worship meets at 10am and attracts people of all ages. A parents and toddlers group meets on Tuesdays and on Wednesdays the hall door is open to all at the "Coffee Stop" when there is an opportunity to meet with others. Priestfield Arboretum is located near the geographical centre of the village on the north-eastern slope of the plateau between Windsor Lane and Hare Lane. Its area is 6.5 acres but because it is tucked away from sight it is one of Little Kingshill’s best kept secrets. The founder, Thomas Priest, in 1917 began planting in the former orchard and kitchen garden acquired after the sale of Harewood Estate, and he planted over 400 trees before his death in 1942. With the owner’s permission, the Friends now maintain the Arboretum, and have added over 100 specimen trees to the 90 original plantings remaining when they first became involved. The collection has a representative of every conifer genus that will grow in Britain (unusual for chalky Buckinghamshire). In 2012 the Village Society installed new oak gates at the entrance on Stony Lane to commemorate the Queen’s Diamond Jubilee. Assistance is always welcome in the friendly work parties that are held on the 3rd Sunday of the month (weather permitting). The Arboretum is open to the public for two days each year with guided tours throughout the day. The Little Kingshill Combined School serves the village and surrounding area. It extends a warm welcome to children from age 3+ into the nursery class, continuing the provision of their education to the age of 11. In 2011 Ofsted reported that: “Little Kingshill provides an outstanding education for its pupils.... Teachers know their pupils exceptionally well and the excellent use of assessment information ensures that work is challenging for all." 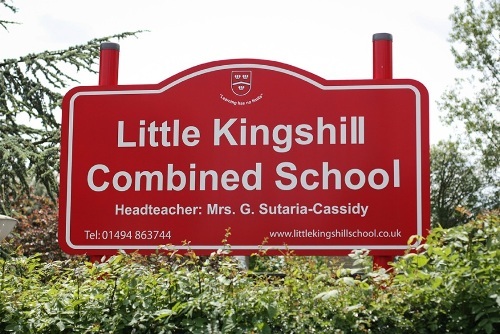 The school is supported by FOLKS (Friends of Little Kingshill Combined School), a group of community members, including parents, grandparents, teachers and friends. They organise events to raise money for the school and the children who learn there. Examples of events run in the last 12 months include: Quiz nights with real ale and curry, Ladies’ Pamper Evenings, and the Christmas and Summer Fayres. The Little Kingshill Nursery School is held in the original village school building, built in 1887 and just across the road from the Combined School. The nursery is open every morning to children from the term after their third birthday, if places are available. The green has been a play area for generations of Meadow Cottages children and their friends over many decades. They gather together to play in a safe location, where parents can keep an eye on them without intrusion into their games and interactions. It provides the opportunity for a wide age range of youngsters from different schools to mix together in outdoor activities, with the older ones looking out for their younger neighbours. Crucially it encourages them outdoors and enables them to foster friendships and and a sense of responsibility for each other through co-operative physical activity and imaginative play. Dating from 1830, the Full Moon on Hare Lane provides a welcoming place to have lunch, an evening meal or just meet with friends for a drink, while still retaining an old fashioned village pub atmosphere. Tuesdays is steak night, quiz 'n curry on Thursdays, there is live jazz on the first Monday of the month and the pub hosts an annual beer festival in July.